From old western tunes to blues, folk, ballads and originals, Lorna Miller’s music covers stories of love, searching and life’s adventures. Accompanied on slide and acoustic guitar, Lorna’s voice is the main vehicle for the musical material she chooses revealing a lifetime passion for music and the love of sharing it. 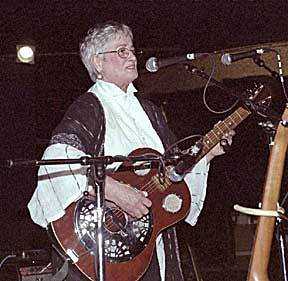 As a life-time performer Lorna’s music has been presented to large and small audiences. The venues range from large festival stages to coffeehouses and all the in-between. Every type of stage is an opportunity to share the musical heritage she received and to honor the gift. All performances are suitable for large or small audience and all ages. For more information and booking, please contact Lorna Miller.